Jackie Fo: Trish and Andrew's Wedding Pictures! 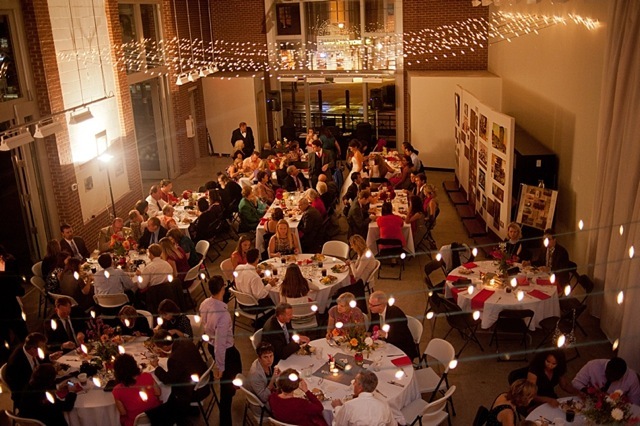 The last weekend of September I had the pleasure of coordinating Trish and Andrew's wedding day. 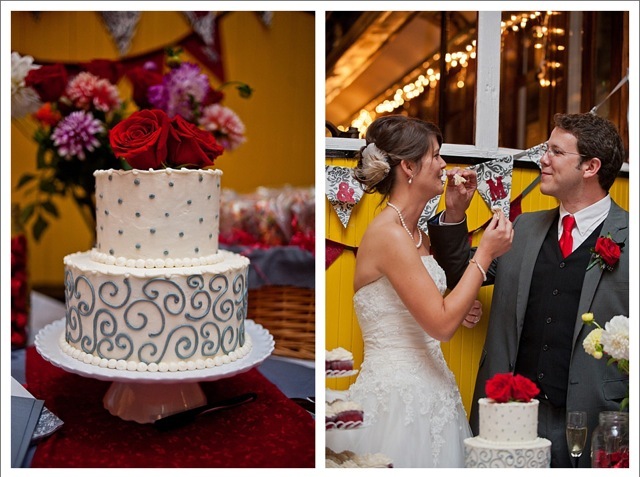 Trish and Andrew are a really sweet couple that had a beautiful wedding. They were so happy and it simply warms my heart (and brings a tear to my eye) when I see my couples dressed up, in love and ecstatic on the day of their wedding! This was fun not only because Trish and Andrew were so sweet, but because two of my former wedding couples were at their wedding! It was so fun to see Misty and Jared and Paul and Cori again! Both couples were beaming with happiness - yay! 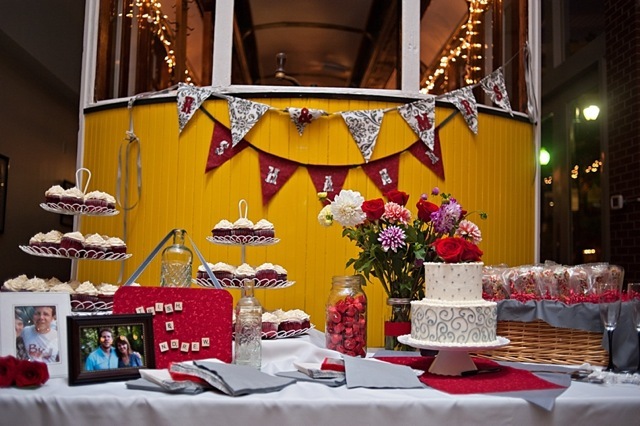 Trish and Andrew's wedding was held at the Charlotte Trolley Museum, which is a really cool spot where I coordinate a lot of events. Their friends helped decorate the venue and handle flowers, which were bought from a local farmers market for an absolute steal! 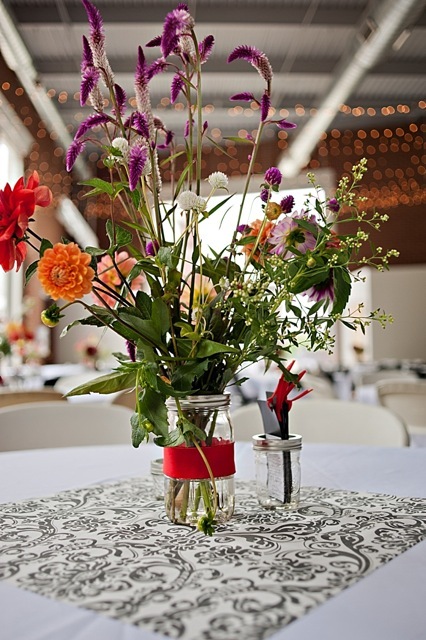 I love the wildflower and dahlia look, it goes perfectly with the decor of the venue. All photos were taken by the talented Lisa Turnage Photography who was a pleasure to work with! Thanks for sharing your photos Lisa! 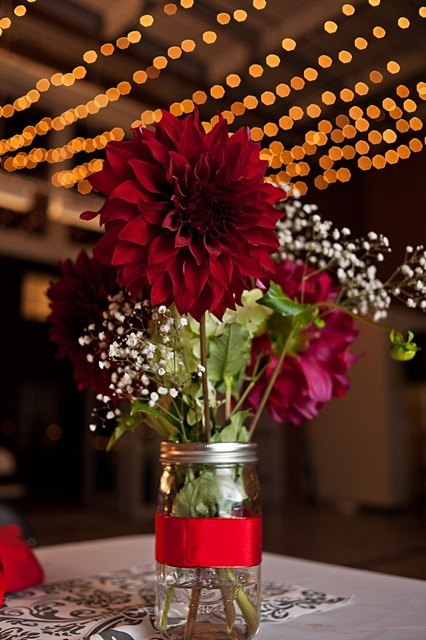 Look at the size of these red dahlias, aren't they gorgeous?! Trish and Andrew's wedding colors were red and gray and I really liked the color combination. The groomsmen's gray suits were perfectly accented with a pop of red from gorgeous red roses! They had a mini cake they cut just for themselves and seriously amazing Red Velvet Cupcakes and Rice Krispy Treats on the dessert table for everyone else. People were dying over the cupcakes and treats! Here's an eagle eyes view of the venue floor! I love the string lights. 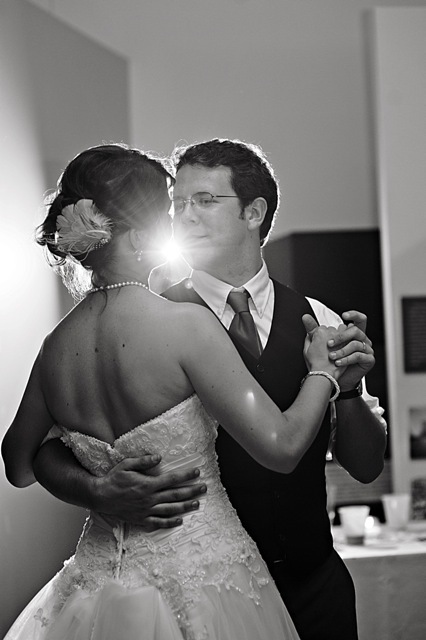 First dance...I love that light coming through them, such a cool photo! 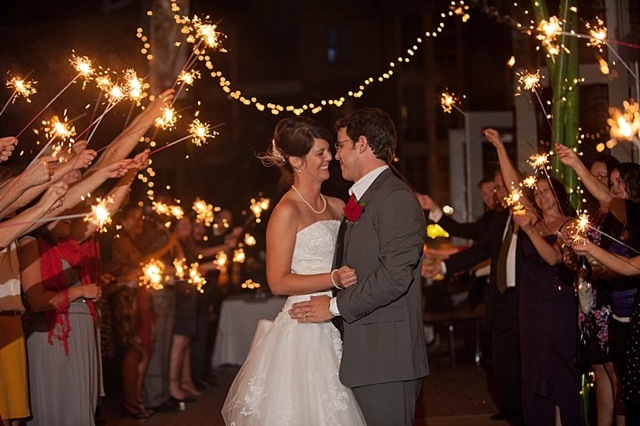 The happy couple exited with a sparkler send-off, which is always a fun end to the evening! Not only were Trish and Andrew lovely, their families were adorable as well. 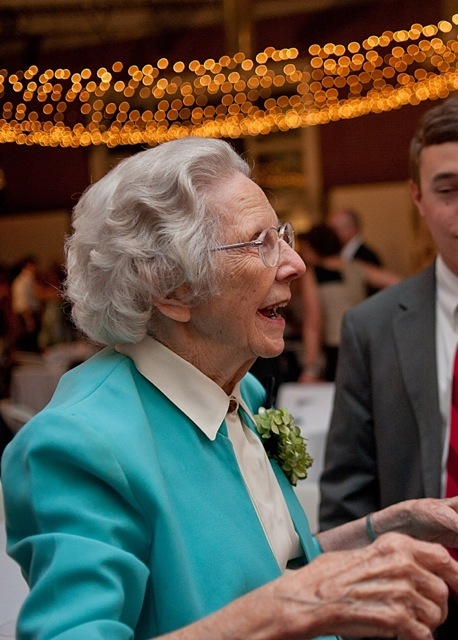 Check out "Mamaw" below...she's the most precious lady ever! I just love this photo! Andrew's grandparents were there and had been married a solid 58 and 1/2 years (they made sure to include the 1/2 year!) When asked by the DJ for advice to give the newlyweds, they said: "Don't give up and have patience." I think that's absolutely fabulous advice and I'll tell you what, that sweet little couple were by each others side the whole night...not that I was creeping on them or anything. Okay, I was, they were just TOO cute! I actually hand delivered their cupcakes because I didn't want them to have to fight through the crowd. They were THAT cute. I wish Trish and Andrew 58 and 1/2 years and even more! Such a pretty wedding! 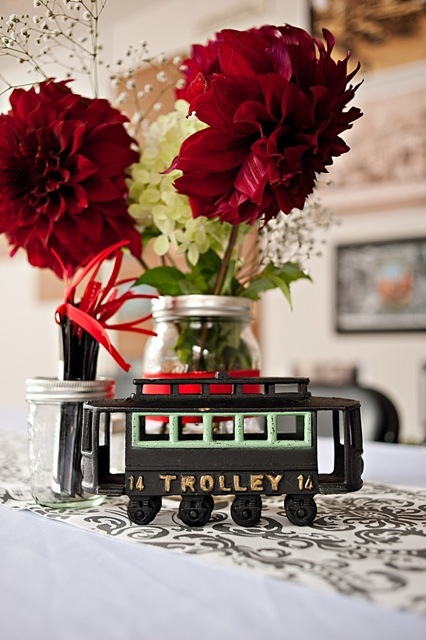 Love the color combo & all the mason jar accents.